Cape Town is the crown jewel of the South African coastlinecape town. With the breathtaking scenery, enviable climate, vivacious people, some of the best beaches in the world, laid back lifestyle and outstanding natural surroundings, it’s easy to think that all of that alone makes this a world class destination. And it is, but there is more. The food, the brilliant, award winning, world class local South African cuisine has proved time and time again, that it is a force to be reckoned with. Cape Town is heaving with some of the best eateries in the world, with sidewalk cafes, 5 star dining, rustic cafes and local vendors serving up some of the very best traditional and Mediterranean fare this side of the Atlantic. Choosing the best places to eat would depend on, well, how much time you have to feast your way throughout the entire Peninsula, so in order to help you, we have narrowed down a selection of our favourite 5. From humble beginnings in a retro residential suburb kitchen, the Africa Cafe is the brainchild of one Jason and one Portia. The menu is seasonal, and patrons can sample dishes from all over the continent of Africa. Bowls with menu choices are brought to your table, and there is no limit on how much you can eat. Every dish has a side of tapioca cheese and yogurt flatbread and you can sip on Kenyan coffee when it is all over. The staff pick up the pace when they boogie around the dance floor (middle of the restaurant) and give you a real African show. An iconic hangout, Mr. Pickwicks has become something of a living Cape Town legend. A small, unpretentious, tucked-away gem that has been around since the cows came home, still serves great home-cooked food in tin plates. There’s a never ending supply of beer – which can make their rickety bathroom stairs a challenge after a few – and a delightful, effervescent vibe, from the decidedly mixed variety of patrons that frequent it. Check out the best milkshakes on the planet and sample great, good old-fashioned, value for money grub. A truly authentic South African experience, from start to finish, and one that is simply unparalleled anywhere else in the country, Moyo offers locals and visitors alike a once in a lifetime experience. Waiters clad in traditional African garb come to your table to wash your hands and paint your face while bringing you a selection of delightful handmade breads. The beat of the African drums, fires, candles, African music, singing and entertainment make this restaurant one of a kind. At the Stellenbosch venue, you can sit in a tree house and look down over your private piece of Africa below. 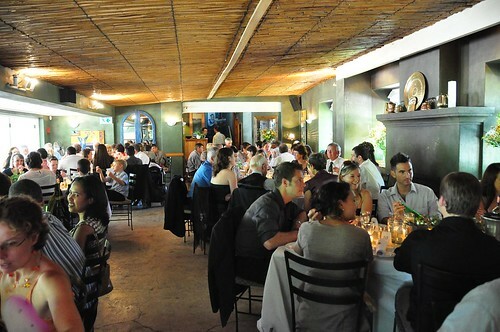 The buffet is completely traditional South African with some contemporary choices. Head out to the suburbs where you can enter another world, right in the heart of the country. In Mowbray, on the historic Valkenburg Estate, you will find the Wild Fig. The fully restored historic manor house and buildings add a certain charismatic charm to the leafy outdoor area that greets you. The substantial menu has something for every palate and is the perfect place to spend an afternoon or evening. Try the traditional ”Melktert” pudding with your tea afterwards. This vibrant restaurant and bar has some of the finest traditional food items, and is perfect for those who are after a bit of live African music and entertainment to accompany their meal. Wild game, fresh Cape Seafood and an award winning wine list are just some of the delights you can peruse on the menu. You must book well in advance though, as it is super popular and you don’t want to be disappointed. These five are among the crème-de-la-crème of restaurants offering authentic South African cuisine in Cape Town, and there’s plenty more. Delicious food in a delicious city – what more could you ask for?